In 2010 the Emergency Preparedness Division and the Hazardous Materials Division were consolidated under EMD as a single department. The move centralized the coordination of emergency preparedness, homeland security and hazardous materials responsibilities. An EMD Duty Officer is on call 24 hours a day to provide assistance to fire, police and medical agencies that respond to emergencies throughout the county. 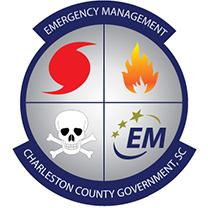 EMD developed and maintains the Charleston County Emergency Operations Plan (EOP) and Re-Entry Plan. These plans provide the framework under which Charleston County prepares for, responds to and performs its emergency response functions. EMD coordinates the Local Emergency Planning Committee for hazardous materials planning and emergency response. EMD also coordinates the "Knox Box" program and receives Tier II Chemical Inventory Reports on behalf of the LEPC. Meetings are open to the public and held the second Wednesday of each month in the Lonnie Hamilton, III Public Services Building (4045 Bridge View Drive; North Charleston, SC). The department conducts programs for the public, emergency responders and industry professionals to include Community Emergency Response Training (CERT) and National Incident Management System (NIMS) courses. EMD also coordinates training announcements from the S.C. Emergency Management Department and the Emergency Management Institute/U.S. Department of Homeland Security. If you are interested in receiving notices contact Jackie Ong. EMD staff is available to make presentations to civic and business groups on emergency preparedness topics. Click here for the Speaker Request Form. EMD also contains the Awendaw Fire Department and is the county's liaison for the Charleston County Volunteer Fire and Rescue Squad. The Awendaw District Fire Department consists of professional and volunteer firefighters who provide fire protection, medical first responder care, wildland fire suppression, vehicle extrication and public educational programs to the unincorporated areas of Charleston County and the towns of Awendaw and McClellanville located north of the town of Mt. Pleasant. Charleston County's Volunteer Fire and Rescue Squad comprises public-minded citizens who contribute funding and volunteer their time to train for and perform the following functions: vehicle extrications and fatality recovery; land and water search and rescue; boating, diving and drowning accident response and recovery; and medical first response for Charleston County Emergency Medical Services. EMD is continually planning and preparing for hazards that could impact the citizens of Charleston County. Remember, no two disasters are the same, and the most effective way to protect you and your family is to be prepared. Click here to see emergency information categorized by the type of threat.